It's the leftover ham time of year, and I'm always looking for new ways to use it up. If I have a lot of ham leftover, I like to dice it and put it in the freezer. It goes really well with Carbonara as well, so my family can expect at least a Chinese and Italian night coming up soon. I have to say that the more Chinese cooking I do from home, the less impressed I am with take-out Chinese, but let me explain: when I first got married almost ten years ago, I bought a big dresser with double doors from a family member. We used it to house our behemoth square TV. Both the TV and dresser quickly went out of style, but we kept it until just a couple of weeks ago when we finally upgraded our TV and sold the dresser for 45 bucks. The next thing I know, I'm heading out on a whim to pick up Chinese take-out at 9:30 at night with a wad of cash in hand. The bill came to $35! So I handed over my dresser money and got a stomachache from gross restaurant Chinese. After almost ten years of TV frugality, Amy's dresser bought me a Chinese take-out run and a bottle of Pepto. My new motto is Just Stay Home. Chop ham and green onion, mince garlic, and gather all the ingredients. Once you start, this process moves quickly. 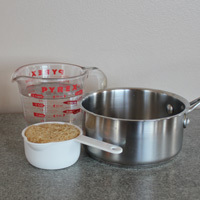 Begin by coating the parboiled rice in 2 T canola oil over med heat for 2 minutes. 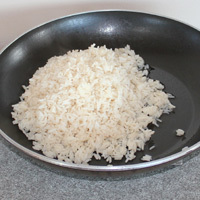 Parboiled Rice is found in bags with all the other regular rice varieties. 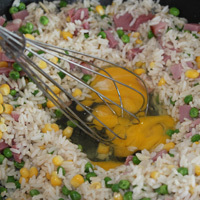 This is the secret to the recipe: the parboiled rice doesn't stick together so the oil and sauce can coat each grain. I repeat, this is the most important part of this recipe! Add the ham and vegetables and sautÃ© for 2-3 minutes until well combined and warmed. Make a well in the center of the pan. Spray with cooking oil so the eggs don't stick. Lightly scramble the eggs. 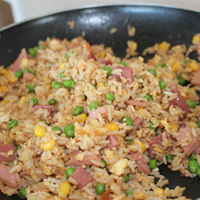 Once they have cooked, stir everything together. Mix the sauce ingredients in a small bowl. 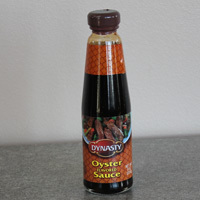 Oyster sauce is not fishy. It's akin to teriyaki sauce but less sweet and is found in the Asian section. Stir in the sauce. See how each grain of rice is coated in sauce? Just like at the restaurant... and it's all because of the parboiled rice. Off the heat, add the green onion and stir to combine. Serve warm. 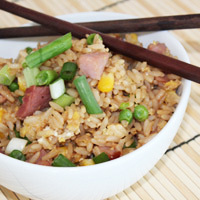 Parboiled rice makes great leftovers, so don't be afraid to save it and re-heat later. Problems: Not using parboiled rice. I feel like a broken record. Cook 1 C parboiled rice according to package directions. It calls for a bit less water than regular rice, and I added 1/2 t salt. 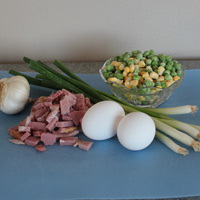 Chop ham and green onion, mince garlic, and gather all the ingredients. Once you start, this process moves quickly. Begin by coating the parboiled rice in 2 T canola oil over med heat for 2 minutes. 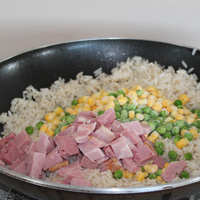 Add the ham and vegetables and sautÃ© for 2-3 minutes until well combined and warmed. 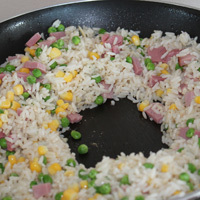 Make a well in the center of the pan. Spray with cooking oil so the eggs don't stick. Lightly scramble the eggs. Once they have cooked, stir everything together. Mix the sauce ingredients in a small bowl. Oyster sauce is not fishy. It's akin to teriyaki sauce but less sweet and is found in the Asian section. Stir in the sauce. 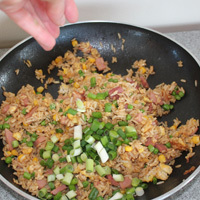 Off the heat, add the green onion and stir to combine.